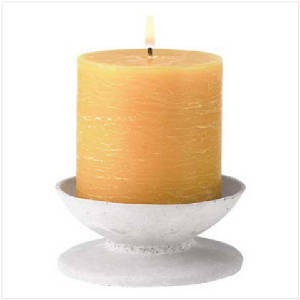 An appealing butterscotch hue and bark-like texture add natural warmth to a classic pillar candle, seated upon an elegant Grecian-style pedestal tray. Simple lines and decor-friendly colors allow this handsome duo to enliven any room with a splash of subtle brightness. Unscented. Paraffin wax; reusable concrete base. 4 diameter x 4 1/4 high. Encased in a gleaming glass lidded jar, this boutique-style candle is a decorator's delight! Long-lasting and highly fragranced, this grass-green candle enlivens a room with the sweet scent of nature and a dash of color. An elegantly uncomplicated enhancement that's appropriate most anywhere! Uplifting pear fragrance. Paraffin wax; glass container. 3 1/2 diameter x 6 high. 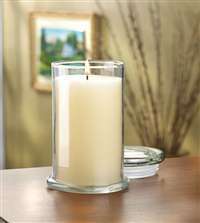 Encased in a gleaming glass lidded jar, this boutique-style candle is a decorator's delight! Long-lasting and highly fragranced, this attractive ivory candle enlivens a room with the sweet scent of nature and a dash of color. An elegantly uncomplicated enhancement that's appropriate most anywhere! Comforting French Vanilla fragrance. Paraffin wax; glass container. 3 1/2 diameter x 6 high.